If you’ve been considering braces but want something that won’t show when you smile, ceramic braces may be ideal for you. 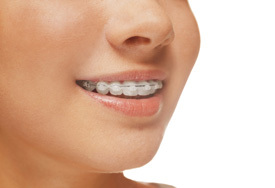 Ceramic braces are just as effective as metal braces, but they are less noticeable. They are popular with our older teenagers and adults because of their cosmetic appeal. Ceramic braces are also a great option for patients who have upcoming photos or events where they don’t want to appear to be wearing braces. Dr. Seim can use clear ties, which are much less noticeable. At Seim Orthodontics, we treat each patient as an individual. We will do a thorough evaluation of your teeth and smile to see if you are a good candidate for ceramic braces. Consultations are always complementary! If you’d like to learn more about clear brackets, Dr. Seim would love to speak with you in person. Contact our practice today to get started. We can’t wait to help you unlock the smile of your dreams—discreetly!